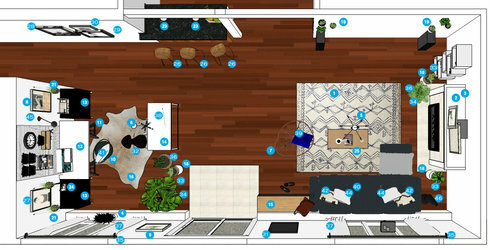 Looking for help with a living/dining room. Client needs help with the main room, a "face lift" for a new space. She has a couch that was a recent purchase that she wants to incorporate, otherwise it's a blank slate. 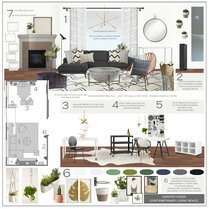 Contemporary style, with some added fun, she's in love with plants and adding texture. 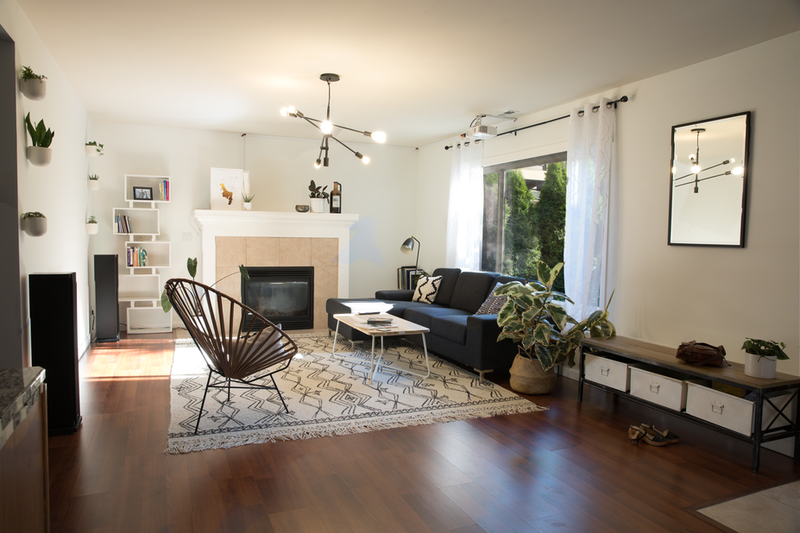 It's an open floor concept with a long living room, plenty of natural sunlight, but it only gets morning light. How to put the pieces together and make it feel "full" and pop and have a distinct feeling. She wants to feel like everything in the space has a purpose, adding detail is where she needs help. She knows she wants pictures, art, plants, and throw pillows, and has a vision for them, but wants help making it flow and look good together. 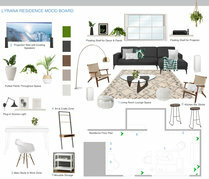 She has a vision for the space, how she will use it, and how each "zone" of the room needs to be used. But she doesn't have ideas on what it means and how it's put together. She does NOT like; cottage-feel, doilies and feminine pieces, she wants color in the plants and certain accents but nothing "glaring" color. She would rather have color come in the smaller pieces than large ones. She needs the Living space to function as a living room, but the Dining space is going to be a mixed use sewing & work station. she doesn't need or want a formal dining table or space for eating. She wants a desk station for work, and then a separate desk or area for sewing and crafts. She is considering this option for making the working desk a "standing height". Suggestions for planter containers are needed! it has a "doily, old formal space" quality to it. The drapes need to go. She does, however, like the bamboo screen on the door. She wants to keep the tall wooden shelf, but is open to repainting it and wants to see ideas of how to incorporate it. otherwise, it can move to the bedroom. Shelf is 20 inches wide and each box is offset by 5, so it's a total of 25 inches wide. It's total 74" high. Client also wants to keep the brown bamboo panels on the sliding glass door. The projector for watching TV will be placed on the ceiling near the window, over the sectional. This means it will project onto the 12' wall, where the speakers are. The speakers are floor units, they will not need to be mounted. Client is going to provide the product link for these. Thanks for the shopping list and everythig else you have done! We love it! Herb Planter with Scissors herb planter for the window in your crafting area Discount link available to project holder only Width: 15.5" Depth: 5" Height: 4.75"
Mobile Chandelier - Large (antique bronze) chandelier for living room area. Arms are adjustable, and you'll need to play with the installation height, placement, and arm swing to work with your projector screen. Discount link available to project holder only 29"diam. x 21"h.
Mobile Pendant - Small (antique bronze) smaller version of the same chandelier, for the office/desk area. should be mounted at least 30" above the desk, so you can still use your standing desk unit. Discount link available to project holder only 16"diam. x 20"h.
organdy (framed print) select size; 18"x24" (unless you decide you want larger. But don't go any smaller) select classic frame; Rich Black Wood Frame select standard full bleed Discount link available to project holder only 18"x24", frame size 19.3" X 25.3"
aeonium (24"x24" framed print) select standard, full bleed select 24"x24" size select classic frame Rich Black Wood Frame Discount link available to project holder only FRAME SIZE 25.3" X 25.3" IMAGE SIZE 24" X 24"
Sidera Chair chair for crafting station. can be accented by a pillow, or left empty. Discount link available to project holder only Width: 25" Depth: 23" Height: 32.5"
LINNMON this is the largest size white tabletop from IKEA. To coordinate and work with the table base. Discount link available to project holder only 59x29 1/2 "
Quantity: 2 two rolling carts for your craft area (let me know if you need suggestions for storage bins/baskets, otherwise just stay simple, something white or woven to match the seagrass baskets) Discount link available to project holder only Width: 30" Depth: 18" Height: 30"
https://www.cb2.com/go-cart-white-rolling-desk/s454133 rolling desk for your laptop/computer work station. Has locks to keep it from moving, but you can also slide it around or rotate. Discount link available to project holder only Width: 47.75" Depth: 23.75" Height: 29.5"
afternoon sun by leslee mitchell (18.5"x24") OPTIONAL decor suggestion Discount link available to project holder only 18.5"x24"
Quantity: 3 planter stands, but you can also use one as a side table next to the sofa. I would suggest a minimum of 2, but ideally 3, if your budget allows. Discount link available to project holder only 9.75"diam. x 16"h.
Quantity: 6 you could choose to mix and match white and black if you prefer, our renderings show only white, but either way would be fine! Discount link available to project holder only 4-inch: 4.3"diam. x 4.3"h.
Speckled Texture Planter optional planter style suggestion. Don't do too many of these, try to use mostly the seagrass that you DIY dip in white paint. Discount link available to project holder only 11.6"diam. x 9.8"h.
Wilder California Beverly Hills Banana Tree Art Print This is optional suggested art for the mantel, to help hide your projector equipment, You'll need to lean it. select black wood frame select 18"x24" size Discount link available to project holder only 18"x24"
Quantity: 3 these are the optional bar stools for the Kitchen area. Use them as inspiration, if you would rather save some money on this purchase. Discount link available to project holder only 15.2"w x 11.7"d x 27"h.
striped suit (18"x24") select 18x24 size select classic black wood frame Discount link available to project holder only FRAME SIZE 19.3" X 25.3" IMAGE SIZE 18" X 24"
in the wind (size TBD) OPTIONAL wall art suggestion. You can choose a smaller size to save money select 30"x40" size select Distressed Charcoal Stain frame Discount link available to project holder only 30"X40"
The tourist (20"x16") OPTIONAL wall art suggestion. select 20"x16" size select Distressed Charcoal Stain frame Discount link available to project holder only 20"x16"
ruffled feather (24"sq) OPTIONAL wall art suggestion. select 24"x24" size select Distressed Charcoal Stain frame. Discount link available to project holder only 24"x24"
sable black chair desk chair Discount link available to project holder only Width: 22" Depth: 27" Height: 35.25"
Quantity: 2 curtain rod. select quantity 2, unless you want to add another set at the entry door, but I think that's not necessary. Discount link available to project holder only 108"-144"
Quantity: 4 Select 84" length. curtain panels for the windows. They might be slightly taller than you want, so it might require a hem/sewing project to raise the seam a few inches. But try it first, you might enjoy having a bit of "pooling" on that top white ledge. Try hanging them before deciding to shorten. Discount link available to project holder only 84"l x 48"w.
HumbleWorks Standing Desk $30 shipping fee to send to the US this is the standing desk that you wanted, in case you haven't already purchased it Discount link available to project holder only 18mm birch, shipping from the UK, dimensions not stated. This product was selected by the client prior to design. izel navy fair isle pillow (18") accent pillow for the acapulco chair Discount link available to project holder only 18"
18"x12" triangle lattice pillow with feather-down insert (feather down insert) accent pillow for sectional Discount link available to project holder only 18"x12"
Macrame Diamond Pillow Cover - Stone White (stone white) white pillow for craft station chair (or, increase to have some white pillows on the sectional) Discount link available to project holder only 16"sq. Quantity: 2 accent pillows for sectional Discount link available to project holder only 16"
Lokima 18 " Pillow OPTIONAL suggestion for pillows if you want more white on the couch that isn't the full price of a sheepskin piece. 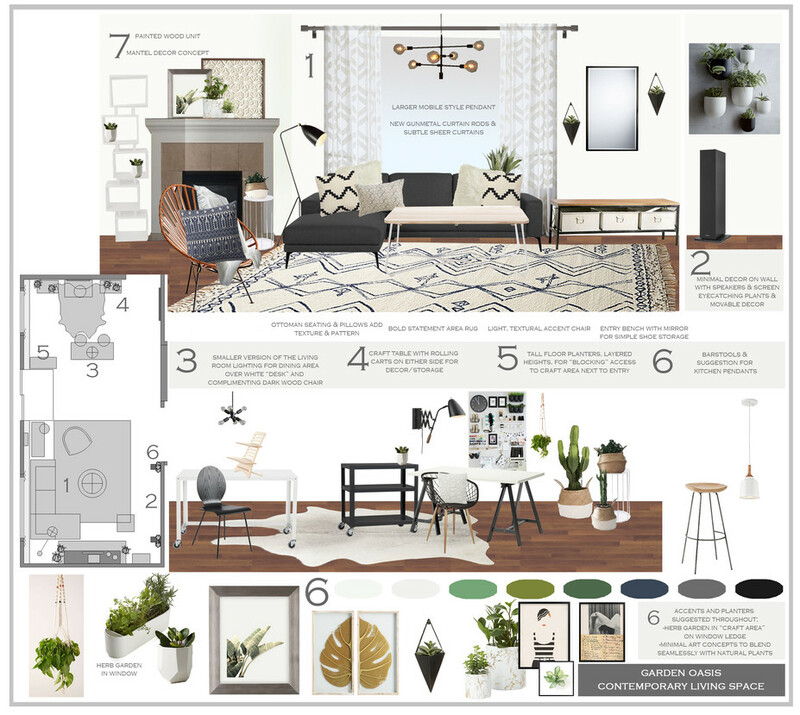 Discount link available to project holder only 18"
16" icelandic sheepskin pillow (feather-down insert) OPTIONAL fur throw pillow for sectional Discount link available to project holder only 16"
Morgan Black Sconce (plug in sconce) sconce for craft table. mount at 4'6" tall, or 5'0", it's a plug in unit so ideally you wait until the desk is in place and you can try sitting and see how high you need the light. Discount link available to project holder only Width: 6" Depth: 26.5" Height: 12"
Quantity: 2 these curtain rods are not available until mid June, but they SAVE you nearly $140 as opposed to the West Elm ones. If you can wait for them to ship. Discount link available to project holder only 88"-120"